Scarlett Blaine’s life in 1960s Georgia isn’t always easy, especially given her parents’ financial struggles and the fights surrounding her sister Juli’s hippie lifestyle. Then there’s her brother, Cliff. While Scarlett loves him more than anything, there’s no denying his unique behavior leaves Cliff misunderstood and left out. 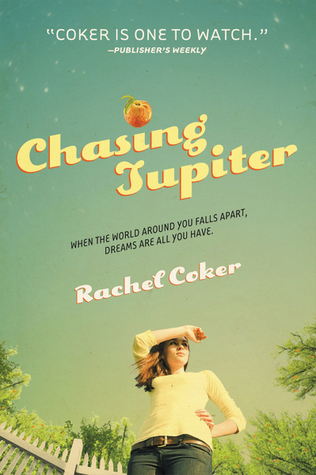 So when he wishes for a rocket to Jupiter, Scarlett agrees to make it happen, no matter how crazy the idea might be. Raising the rocket money means baking pies, and the farmer’s son, Frank, agrees to provide the peaches if Scarlett will help him talk to Juli. The problem is, Scarlett really enjoys her time with Frank, and finds herself wondering if, someday, they could be more than friends. Just as she thinks everything might be going her way, Cliff suffers an accident that not only affects the rocket plans, but shakes Scarlett’s view of God. As the summer comes to an end, Scarlett must find a way to regain what she’s lost, but also fulfill a promise to launch her brother’s dream. Okay, I know what I like and I know what I don’t like. Unfortunately, I didn’t know this book fell into the category of things I typically don’t like. I’m not the biggest fan of Christian Fiction. I simply don’t like my reading material to have undertones of religion and what the reader should or shouldn’t believe in. I was surprised with this book. The writing was beautiful and very well put together and though Scarlett was driven through finding God to help put herself back together, I didn’t feel like Coker was forcing a religious belief on whoever was reading her words. I really enjoyed Scarlett’s journey to finding herself and what she believed in and finding a way to cope with all the challenges life threw at her. My one complaint was (and I understand why Coker did it, I just didn’t agree with it) was how much was thrown at Scarlett in a very short amount of time. I always feel like both the characters and the reader don’t have time to process everything that’s going on. HOWEVER, I think the way that Coker presents all these challenges that Scarlett would have to overcome, though fast-paced, were still organized enough for the reader to follow along and understand what was going on. Overall, a really good, quick read! A little something different from what I usually go for! I would recommend this one to someone who is looking for something different to read. Definitely not a book to get someone out of a slump though – overall just a good read. Nothing spectacular. Absolutely! Such a great and unique read.